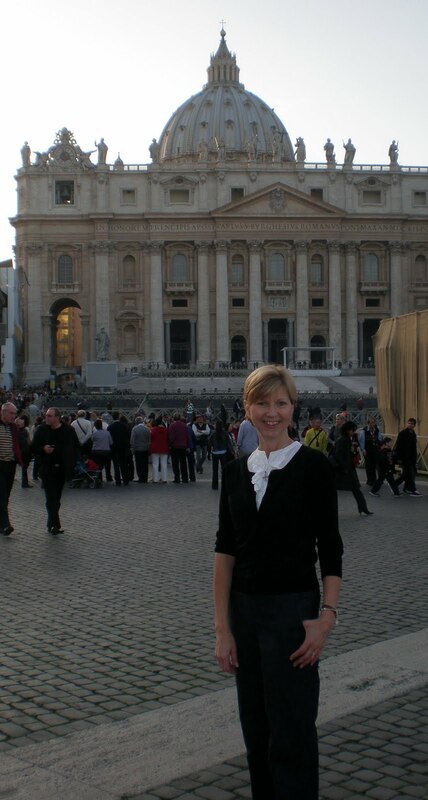 I'll be "up close" to the heart of the Church, which as we know is at the Vatican in Rome, Italy. I am very honored that I was recently chosen to participate in the "Church Up Close Program" for Catholic journalists which will cover "the Church in the age of Pope Benedict XVI." From the program description: Combining class-room seminars, personal meetings, and on-site visits, the Seminar gives journalists an array of tools to strengthen their coverage: a basic sense of the lay of the land at the Vatican; a serious, in-depth analysis of specific hot-button issues confronting today’s Church; a personal introduction to some knowledgeable insiders and key players in Rome; a taste of the rich history and culture behind contemporary Church affairs; a chance to dialogue, in an ideal setting, with journalists from around the world, on the complex relationships between religion and the media. With God's grace and my participation in this program, I'll be keeping you posted on what's happening in the Church! Pray for me please! 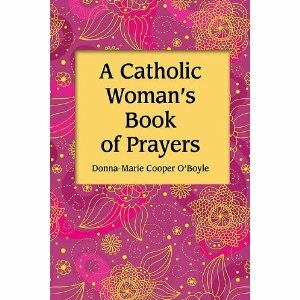 I just had the great fun of looking through the interior of my newest book: A Catholic Woman's Book of Prayers! I had to check it all out thoroughly before it's sent off to the printer. I have to say in all honesty that the book looks so lovely! The interior carries the theme of the beautiful cover throughout all of the pages with added pretty embellishments to please the eye while one is reading up on all kinds of subjects applying to Catholic and Christian women as well as seeing and praying many applicable prayers for the journey. Yesterday, as I read through the words that lay across the interior pages of the book - words I had written earlier on as I prayed intensely all the while for the most perfect words to come for this book - a distinct warm and affirming feeling came to me about this prayer book for women. I am praying that this book will reach many souls and aid women all over who are targeted by the media, accosted by the culture, and who are burning the candle at both ends most times striving to serve God, their families, and their various apostolates. Oh, did I mention it will be released in September? I can't wait for you to see it! Grace Cafe: Take Me Away contest winners will be announced this week end. Stay tuned! 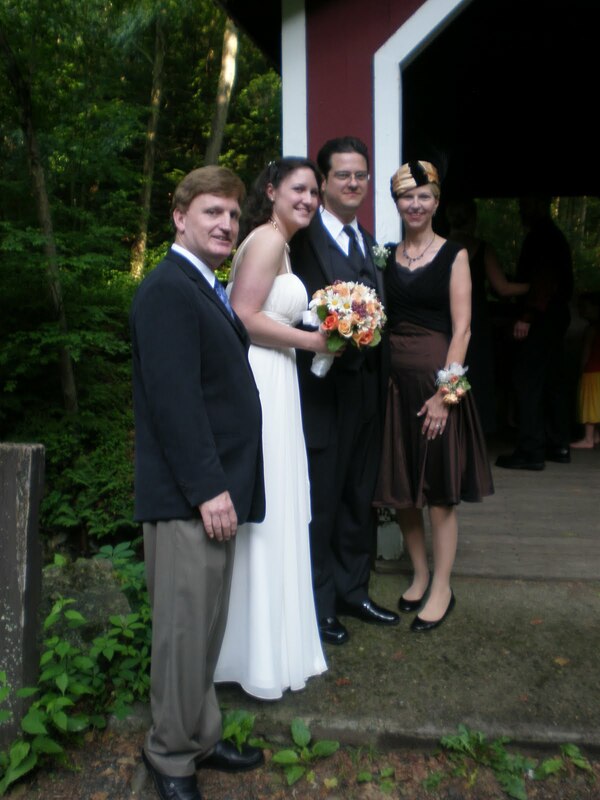 Here's another shot (hubby and me "bookending" the bride and groom) of a different angle - you can see the feather on my hat here. I was wearing flats during these shots because of some rough terrain. I changed back into heels after a few impromptu shots. I had my flats handy with me to slip into later on if my feet got tired (or my back ached too much) after a long evening in heels. I am also debating whether or not I will share a video of the toast I gave at my son's wedding reception. It turns out that my daughter videotaped it with her camera. It was a pleasant surprise to find out later on. I'm glad we'll have that sweet memory to reminisce in later times. I don't think I will be posting it though - sorry. My friend Joan from "Joan's Rome!" If it happens in the Eternal City, EWTN Bureau Chief Joan Lewis knows about it, gets the interview, and gives EWTN viewers and listeners the best reportage going. Of late, Joan interviewed Cardinal Dzwisz on his 40-year friendship with Pope John Paul II, and shares the highlights of that experience with "Bookmark" Host Doug Keck. Blessings galore - my son's wedding! How did my son grow up so fast? - something we parents often ask ourselves. I had a brand new reason to ask myself this question recently as my mind actually flashed back to my son's birth. He's always made me so proud as his mother. At Justin's wedding reception just a little over a week ago, I gave a short toast. One thing I mentioned was that I was not only proud of Justin because he was my son, but because of the human being that he is. I love him so! He chose a beautiful bride to spend the rest of his life with. I'll share just a few photos now and will come back soon to share some more. 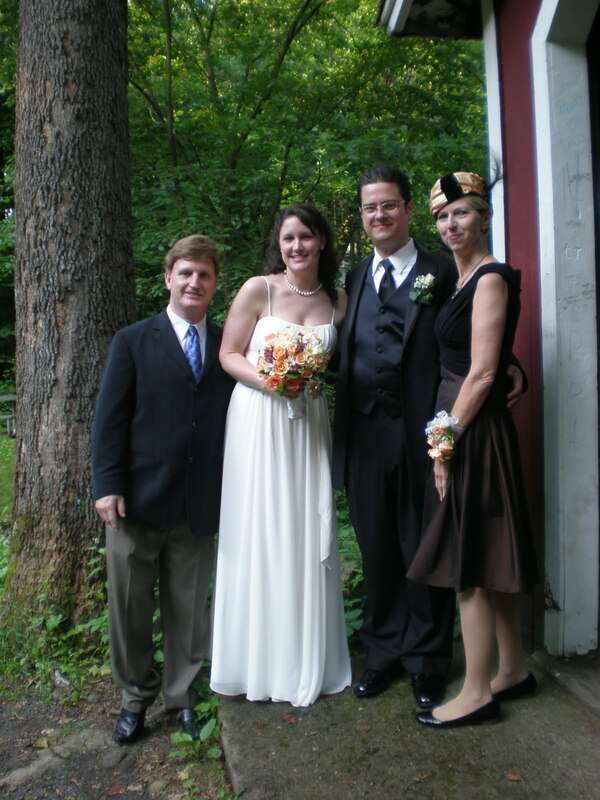 With bride and groom and hubby at an informal photo session at a beautiful rustic location chosen for memorable photos (professional photos coming later). Notice the hat! There's a tall feather on it too, but hard to see here. The newlyweds had chosen a 1920's theme for their wedding day. I wore the hat for a while and then took it off since I am not used to wearing one - I could only stand it for just so long! 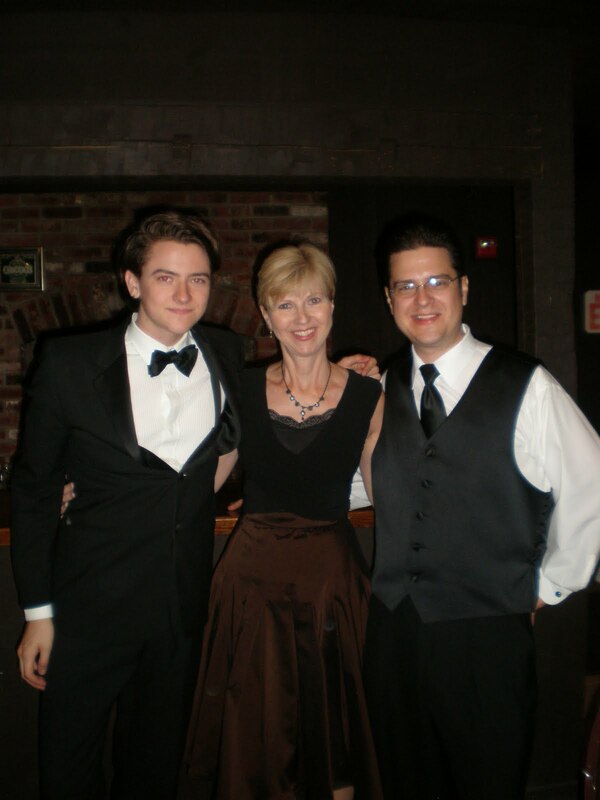 At the reception towards the end of the evening standing between my two amazing sons (groom on right). 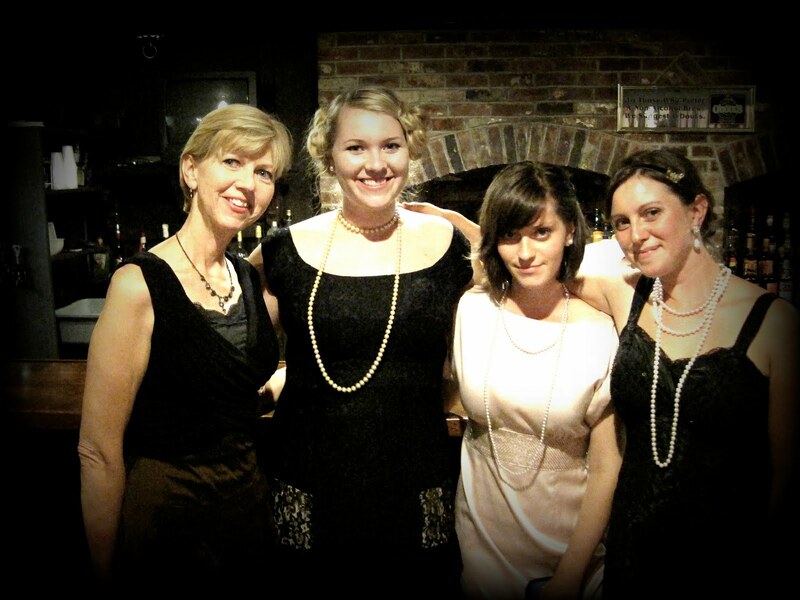 Standing with my three daughters at the 1920's themed wedding reception. This caught my eye. Does it look yummy to you? 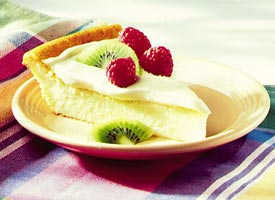 Get the very easy recipe for the "Impossibly Easy Cheesecake" here. 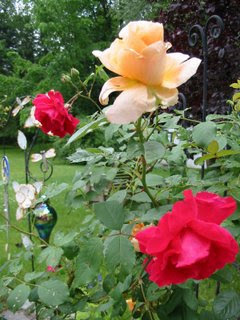 Just the thought of summer fast approaching could bring thoughts of rest and relaxation to our weary minds. We may recall the lazy days of summer during our youth and crave a time to kick back and relax. School and homeschooling will be finished for the year, so we may even anticipate a bit of excitement and adventure getting us out of the ordinary routine; possibly exploring new places or trying new things with our families. Some families plan escapes to beaches and paradise vacations, while others may stay home with a much more relaxed schedule from the school year, affording lots of time to play games, read books and plan day trips to fun spots. The local library is a nice place to visit with the kids and combines a learning experience with the excitement of new books to look at or read, depending on their age and interest. Parks and recreation centers open new opportunities to play, enjoy, and explore. Summertime can be a time of well-deserved rest and also a welcome change of scenery. While making plans for our families this summer, let’s not forget about the prayer. Summer is certainly not a time for our faith to go on vacation, after all. A change in schedule once we hit summertime and an eagerness to “get away from it all” could inadvertently possibly cause us to lose touch with our spiritual needs...(Continued here at Catholic Exchange). catching up, or trying to! Hi everyone! I will be posting some things here soon. It's been so busy with work and family. My son got married! 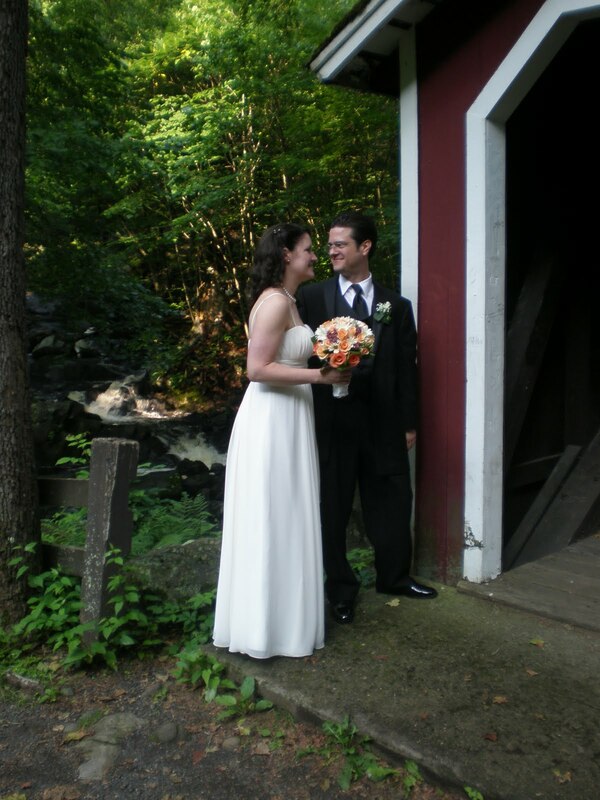 Yes, he did - he got married on Saturday! I'll share some photos and catch you up with things very soon. Feel free to share here in the comments what you'd like to do this summer. Any plans? What books are you reading? What will you do with your children? Any trips planned? How are you planning to keep prayer in summer? I'll be posting an article about that soon. 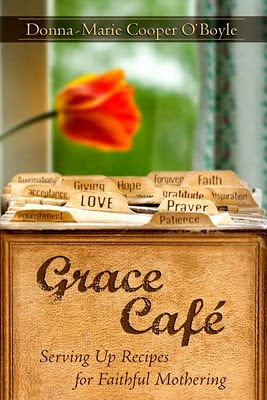 Don't forget to enter my Grace Cafe: Take Me Away contest! There's still a little time to enter. See details here. OSV Daily Take: Is technology reshaping your brain, your family, your life? Grace Cafe: Take Me Away! At 10 a.m. on Friday 11 June, the Solemnity of the Sacred Heart of Jesus, the Year for Priests will officially come to an end with a Eucharistic concelebration presided over by the Pope in St. Peter's Square. During the Mass the clergy will renew their vows and the Pope will proclaim the holy "Cure of Ars" as patron saint of all priests. All the priests of the world have been invited to the meeting, which is being promoted by the Congregation for the Clergy and has as its theme: 'Faithfulness of Christ, Faithfulness of Priests'. VATICAN CITY (VIS) - A world meeting of clergy will take place in Rome from 9 to 11 June to mark the end of the Year for Priests, called by Benedict XVI to mark the 150th anniversary of the death of St. John Mary Vianney, the holy "Cure of Ars". All the priests of the world have been invited to the meeting, which is being promoted by the Congregation for the Clergy and has as its theme: "Faithfulness of Christ, Faithfulness of Priests". The theme of the first day, 9 June, will be "Conversion and Mission". Cardinal Joachim Meisner, archbishop of Cologne, Germany, will preside at a meditation in the basilica of St. Paul's Outside-the-Walls, which will also be relayed to the basilica of St. John Lateran. This will be followed by a period... Continued here. 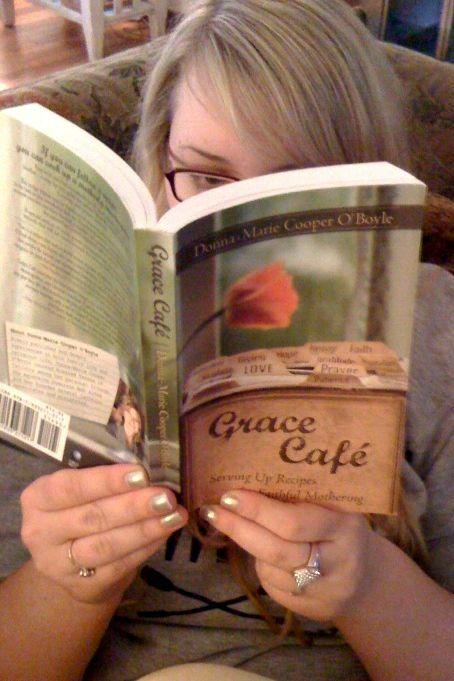 Summertime Book Contest: Grace Cafe: Take Me Away! I think it's time for another book-give-away, don't you? With summer fast approaching, I thought I'd have a contest: GRACE CAFE - TAKE ME AWAY! What do you think? Summertime is an ideal season to be rejuvenated as we attempt to slow down a bit if we can and enjoy our families and all that the season of summer brings us. So, with that said, all who leave a comment below will be entered into my contest. In your comment, tell me why you absolutely need to win a copy of GRACE CAFE: SERVING UP RECIPES FOR FAITHFUL MOTHERING for your summer reading. I will be awarding three books. Those of you who send me a photo of yourself reading one of my books to my email address DMCOBoyle(at)aol(dot)com) in addition to your comment, will be entered THREE times into the drawing! If the winners already own Grace Cafe, they may choose another of my books as their prize. Regarding the photos, your face can be covered if you wish (with the book you are reading) or whatever you'd like. Don't be shy. 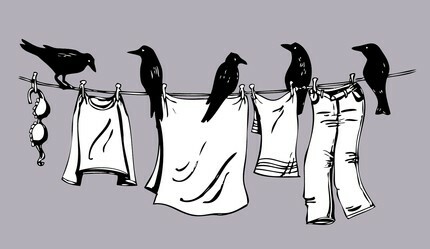 You can be creative too. I possibly will follow up with an additional contest and enter the most creative photos received. Some or all photos received might be posted on my blogs or website. So, entering your photo, gives your permission to be posted. You only have until June 21st, the official first day of summer to get me your comments and photos. The contest ends at midnight Eastern time of June 20th. So, be quick and get your entries in! Also, you may enter for someone else too. For instance, if you'd like your mother, friend, cousin, daughter, or whomever to have a chance to win too, just send in a comment and explain why that person should win. Remember, photos get you a better chance of winning. Plus, of course, I'd love to see you in them! :) Please be sure to leave a contact email address in the comment and with the photo so that I can contact you should you win. Good luck and God bless everyone! Stay tuned here too for some additional summer posts. I'd love to hear from you!